Charlotte, usually called Tatty, is generally not known around Good Day Orphanage as being good at anything. When Miss Lavender and Miss Plum go away for a few days, however, Mrs. Singlittle comes to take their place, and she takes a strong liking to Charlotte right away. She gives her the nickname of Good Charlotte during their very first meeting, and despite Charlotte's feeling that it's a misnomer, it sticks. That very same day, a mysterious girl with blue hair arrives at the orphanage. Her name is Esmerelda, and she claims to be a princess who has been enchanted by goblins and must remain that way until the first snowfall of the year. Like Mrs. Singlittle, Esmerelda also takes a liking to Charlotte and chooses her to be her special friend. This short and sweet chapter book has much in common with other school stories, but adds a supernatural twist. I spent a lot of the story trying to figure out whether Esmerelda was a real princess, an imaginary friend, or a real girl masquerading as a princess, and my opinion is that it never becomes clear, but that it doesn't really matter. The larger focus of the story - Charlotte seeing herself in a new light after a few unexpected kindnesses - comes across just as strongly whether Esmerelda is magical or not. The situations in the story, and the relationships among the girls are what you might expect from a typical school story, but the supernatural element and Charlotte's very relatable flaws and mistakes help it to stand out a bit from others. Fans of cozy stories about orphanages and boarding schools, as well as those who like a touch of magical realism in these types of stories will love this sweet book. It reminded me of a cross between the Orphelines series and Dory Fantasmagory. 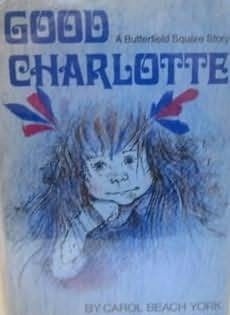 This book is also apparently the inspiration for the name of the rock band, Good Charlotte. The Internet says the band hadn't read the book, though, so they really just liked the name, not the character herself.